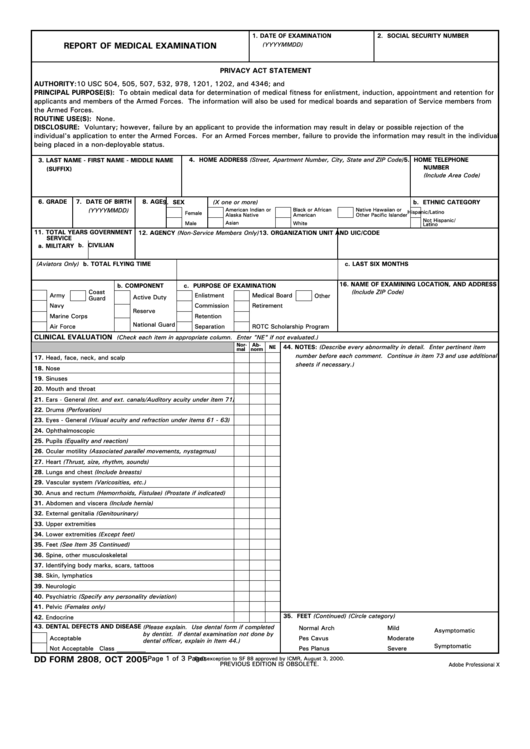 Download a blank fillable Dd Form 2808 - Report Of Medical Examination - 2005 in PDF format just by clicking the "DOWNLOAD PDF" button. Complete Dd Form 2808 - Report Of Medical Examination - 2005 with your personal data - all interactive fields are highlighted in places where you should type, access drop-down lists or select multiple-choice options. AUTHORITY: 10 USC 504, 505, 507, 532, 978, 1201, 1202, and 4346; and E.O. 9397.
being placed in a non-deployable status. DoD exception to SF 88 approved by ICMR, August 3, 2000.